Focal has introduced Elegia Headphones, the first audiophile circumaural closed-back headphones that come with full-range speaker drivers. Focal said the custom-designed Elegia technology is for delivering exceptional dynamics and precise sound reproduction via headphones. The speaker drivers are designed to deliver unparalleled naturalness and realism. Equipped with electrodynamic transducers for optimum elongation, Elegia offers a highly linear frequency response up to 23 kHz. The phones produce minimal noise and distortion even at the lowest frequencies and the highest volumes — allowing the sound to go beyond the limits of traditional headphones. 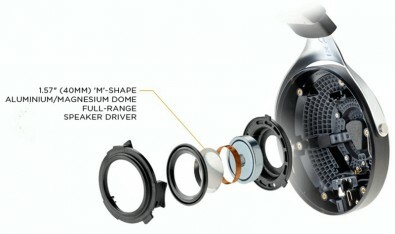 Focal Elegina expanded view of headphone construction. Elegia’s speaker drivers use an ‘M’-shaped inverted dome to deliver precise sound reproduction. Equipped with an onboard motor, a frameless copper voice coil and a dedicated 110 micron surround, Elegia delivers striking sound quality from the first few seconds of listening. Elegia’s custom headband hugs the head like a custom-knit cap. The 20mm memory foam microfiber earpads feel like wearing like wearing big fuzzy slippers on your ears. The culmination of 40 years of expertise in French design and manufacturing, Elegia is made out of leather, solid aluminum and microfiber to combine a sleek, stylish design with maximum comfort. Elegia headphones are priced at $900. The best video is not watchable by mass audiences unless the sound is equally good. That’s why monitoring sound with good quality headphones is essential. But, why do so many videographers shun headphones in the field? One of the most frequent questions that audio manufacturers get is whether their engineering customers should mix sound on headphones or studio monitors. The answer is simple. High quality mixes can be achieved on either…or both.